Welcome to my website and today we are going to learn about Microsoft Access VBA. I am going to show you how to use the FileDialog property to get the selected file name in MS Access 2016. This method should works on previous MS Office version as well. So basically, this VBA will open the file dialog and then get the selected file name and then display the file name and path in the Access Form. We are going to use one Button and one Label. Now let’s design the Form. Then the Code Builder window will open up. 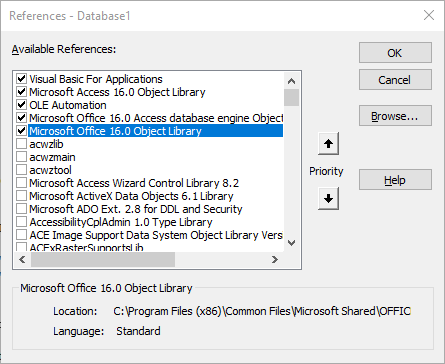 You will need to add the Microsoft Office 16.0 Object Library. To do this, go to Tools | References and then enable the Office 16.0 Object Library from the list and click OK.
'Add filter to the fDialog. I want to filter the .xlsx and .xls only. .Title = "Please select the Excel file"
MsgBox "You choose Cancel button"